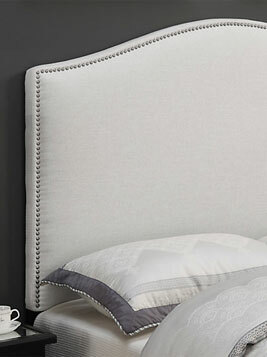 Adding visual appeal and interest, a distinctive headboard can create a focal point and set a new mood in your room. This great option to refresh your space without replacing your entire bedroom set. Headboards can be the perfect option if you prefer a minimal look without a footboard since they attach simply to the metal bedframe that comes with your mattress set or to the wall. 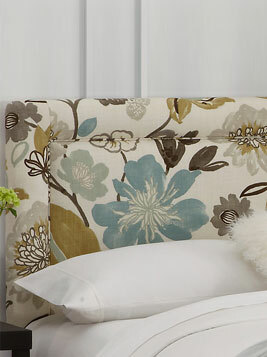 The width you choose for your headboard will depend on your mattress size: Twin, Full, Queen, King or California King. Choose a headboard that matches the size of your mattress so that it will attach to your mattress frame and create a polished look. Often Full/Queen sized headboards and King/California King are designed with multiple attachment holes to fit either size mattress frame but this isn’t always the case so check the sizing carefully. The height of your headboard will depend on your room layout, ceiling height, wall hangings and your style preferences. Tall headboards add drama to your room, while lower headboards can have an understated minimal appeal or lend a modern vibe. Many headboards offer the option of adjusting the height up or down by several inches to accommodate different mattress heights. Ideally, you want the bottom of your headboard to be at or just below the surface of your mattress so that you can enjoy as much of your headboard as possible without any gap showing. Pro tip:If your headboard sits higher than the top of your mattress and is not adjustable, use pillow shams and decorative pillows to hide any gap. 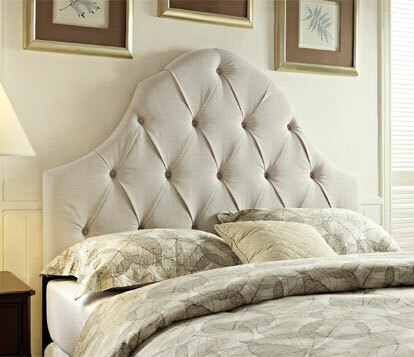 Headboards are available in a wide range of shapes and styles. Arched, camelback or scooped add elegant curves to your decor, while stepped and rectangular headboards have a straightforward linear, geometric presence. Styles range from traditional to modern, and from rustic and casual to luxe and formal. Consider your existing room decor, but don’t be afraid to experiment by mixing styles for a custom tailored, individual look. Upholstered with leather, faux leather or woven fabric headboards are available simple and unadorned or with patterns, tufts, and embellished with panels, stitching details or nailhead trim. 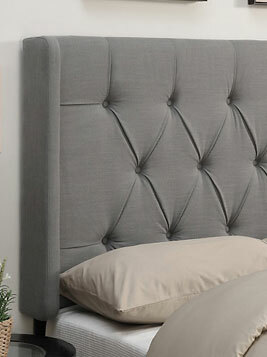 An upholstered headboard is a great option when you are buying a bed separately from the rest of your bedroom furniture because of the beautiful way it complements your space, adding texture and color to your room while eliminating the challenge of trying to match or coordinate wood finishes. Pro tip: Include a bed skirt to match your bedding or headboard; a skirt will give your bed a finished look by covering the utilitarian bedframe. If you are looking for an entirely new bedframe including headboard and footboard, check out our bed buying guide. If you are looking for a new mattress, have a look at our mattress guide.